The BM 60 bookletmaker is a compact and simple to use bookletmaker for hand feeding. This machine is able to saddle staple and fold booklets of up to 22 sheets of 80gsm paper, giving up to 88 page booklets. 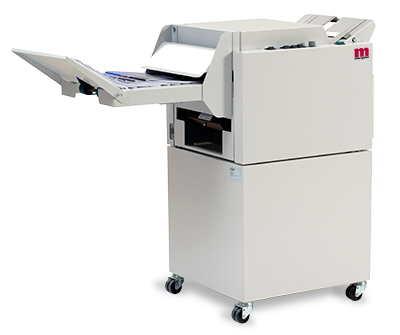 Side and corner stapled documents can also be produced with this versatile machine. Sheets ranging from 60gsm to 250gsm and from SRA3 to A5 can be run to produce A6 to A4 sized booklets. Booklets with loop stapling can also be produced, by simply changing the stapler head. Up to 1800 booklets can be produced per hour on this well proven and sturdy product machine. The BM 60 is a market leader for the hand fed bookletmaker segment.